Three out of four regional speed camera authorities report that camera vans are spending less time catching speeders than last year, an MCN investigation can reveal. In some counties the chances of you running into a speed camera van has fallen by 70 per cent in 12 months. MCN reported last month that a Freedom of Information (FOI) request for details of enforcement hours had been submitted to regional camera authorities created in the Government’s National Safety Camera Programme. At that time early responses already showed that enforcement in some areas had fallen by nearly 60 per cent. Now a fuller set of responses has been received, creating a picture of speed camera decline across the country. Out of 24 regions across the UK to provide the information requested, 18 reported a reduction in hours speed camera vans spent on the road in June 2007 compared to June 2006. Sussex reported a fall of 70 per cent, based on enforcement officer hours. Cleveland and Gloucestershire reported falls of around 60 per cent and Essex and Wiltshire of around 40 per cent. Cambridgeshire, Northamptonshire, Nottinghamshire and Somerset all said enforcement was down by around a third. Under the Government’s National Programme, regional authorities consisting of partnerships between police and local councils were set up to run cameras using money raised in fines. That scheme was scrapped in April, leaving local councils to pay for cameras out of a general road safety grant. Now it appears the changes have sent speed camera enforcement in many of the partnership areas into meltdown. Across all the regions to provide the data requested, the number of hours speed camera vans spent catching speeders dropped by seven per cent but the figure was kept down by disproportionately large rises in small number of areas. West Mercia reported a rise of 201per cent, from 150 hours spent catching speeders in June 2006 to 452 in June 2007. A spokesman said the dramatic increase was the result of severe staff shortages in June 2006. Some regions, including North Wales, home of controversial chief constable Richard Brunstrom, refused to provide the information requested. See the actual responses sent by each regional camera partnership by clicking on the links below. Get MCN today (Wednesday, August 15, 2007) for a more in-depth analysis of speed camera decline across the UK. I am in receipt of your original FOI request dated 2nd July 2007 and the subsequent correspondence in relation to your query. Having now extracted the required information from the sheets I can now advise you of the following information. A total of 4 mobile cameras were in use in June 2006 and they were in use for 7hrs 07mins; 23hrs 24 mins, 35hrs 10mins and 66hrs 31mins respectively. The total time for the 4 cameras was 132 hours and 12 minutes. The same information for June 2007 is not yet available but I would estimate that this would be available towards the end of August 2007. Freedom of Information Enquiry. Re safety cameras. Request; please state the number of mobile speed camera units deployed in your safety camera partnership area in June 2007 and the total number of hours for which each one was deployed. Please also provide the same data for June 2006. Response; I can confirm that the Norfolk Safety Camera Partnership operates 5 mobile safety camera vans and 1 motor cycle. These have been in operation for the year, 2006 and 2007. Whilst these are mobile safety camera “vehicles” they are not utilised 100% each day on enforcement duty. They are used for conveying equipment, conveying officers to court, and training, carrying out demonstrations, and supporting other police casualty reduction duties. The required action to provide the information you have requested, as detailed above, would exceed the cost threshold by which we are legally required to respond to your request. Section 12(1) of the Freedom of Information Act (2000) states that a public authority is not obliged to: “comply with a request for information if the authority estimates that the cost of complying with the request would exceed the appropriate limit”. The Freedom of Information (Appropriate Limit and Fees) Regulations 2004, defines the “appropriate limit” for the Norfolk Constabulary as £450, and specifies that this sum equates to 18 hours work at a standard rate of £25 per hour. Each day a log is completed for each vehicle showing its deployment. It would be necessary to check each log for each vehicle in order to extract the information requested. For the period requested, this would take approximately 45 hours and exceed the appropriate limit in terms of costs, and therefore Section 12(1) of the Freedom of Information Act (2000) applies. In accordance with Section 17 of the Freedom of Information Act (2000). This letter serves as a Refusal Notice. In June 2006 we had the capacity to deploy 4 mobile units based on a shift pattern between 6am and 12 midnight. In September 2006 we added a motorcycle enforcement officer. This remains unchanged in June 2007 ie 4 mobile vehicles and one motorcycle. We do not keep records of actual hours on the road, only the shift patterns worked which is a 9 or 10 hour day minus 30 minutes meal break. Realistically we estimate that each unit spends upto 7 hours a day on site or travelling to site. The shift pattern means that two members of enforcement staff are at work on most days. To obtain a more accurate figure would result in a trawl of daily work sheets which is a manual process which will be extremely time consuming. Further to your recent application for access to information under the Freedom of Information Act 2000. The Council does not hold this information and would advise you to contact the Freedom of Information Officer for Humberside Police who may be able to help you. I am sorry that the Council is unable to assist you on this occasion. I am writing with reference to your Freedom of Information request dated 2/7/07 asking for the number of mobile units deployed in this area in June 2006 and June 2007; also the number of hours for which each vehicle was deployed. The number of mobile camera units deployed in the Devon and Cornwall Safety Camera Partnership area in June 2006 was 7. The number deployed in June 2007 was also 7. With regard to your request for hours of deployment I must advise you that this would involve a manual review and analysis of all working logs. The cost of providing you with the information is above the amount to which we are legally required to respond i.e. the cost of locating and retrieving the information exceeds the ‘appropriate level’ as stated in the Freedom of Information (Fees and Appropriate Limit) Regulations 2004. It is estimated that this would cost £1800 to comply with your request. Therefore this letter represents a Refusal Notice for this particular request, however, you may wish to refine and resubmit your request. You have the right to ask us to review this decision. If you wish us to review this decision please set out your grounds for review in writing and send them to the Force Information Manager, Strategic Development Department, Devon & Cornwall Constabulary, Middlemoor, Exeter, EX2 7HQ, Devon. If you are still dissatisfied after an internal review you also have the right to appeal to the Information Commissioner at Commissioner’s Officer, Wycliffe House, Water Lane, Wilmslow, Cheshire, SK9 5AF, telephone 01625 545700. Response 1: There were 6 mobile speed camera units deployed in our partnership area in June 2007. Response 2: After weighing up the competing interests I have determined that the disclosure of the above information would not be in the public interest. I consider that the benefit that would result from the information being disclosed is outweighed by the potential consequences to law enforcement and the impact of such a release on road safety measures. Not all mobile cameras are equally active. If information concerning a certain camera was released it could give the impression that the chances of being recorded speeding was low, which may encourage higher speeds and hence casualties at those locations. For camera enforcement to be truly effective there must be the perception that the chances of being recorded are high at all sites. This information contains working practices that if known could have an impact on the health and safety of the general public. Considerations include the fact that the disclosure of specific data on camera sites could make the camera deployment less effective which would impact on the safety of pedestrians and road users at large. 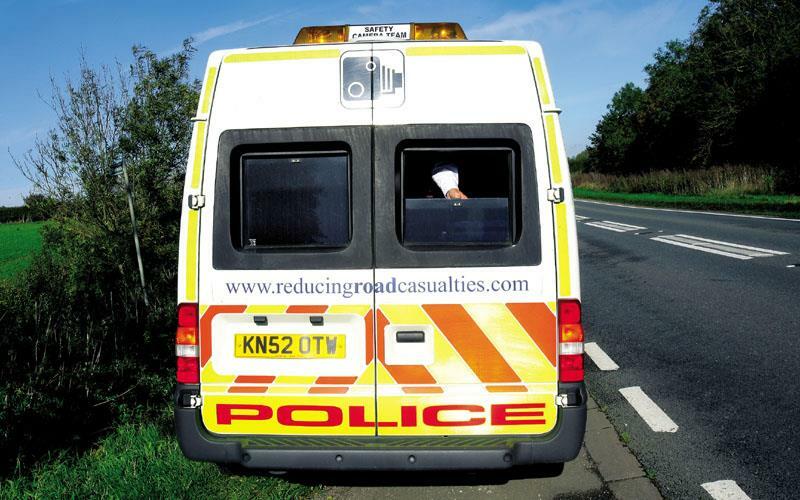 Response 3: There were 6 mobile speed camera units deployed in our partnership area in 2006. For the second part of the request see the answer under response 2 above. Should you have any further inquiries concerning this matter, please contact us quoting the reference number above. If you are dissatisfied with the handling procedures or the decision of Hampshire Constabulary made under the Freedom of Information Act 2000 (the Act) regarding access to information you have the right to lodge a complaint with Hampshire Constabulary to have the decision reviewed. In all possible circumstances Hampshire Constabulary will aim to respond to your complaint within 20 working days. After Hampshire Constabulary has reviewed the decision if you are still dissatisfied you may then make application to the Information Commissioner for a decision on whether the request for information has been dealt with in accordance with the requirements of the Act. As we are no longer governed by the DfT it is no longer a requirement to record the hours of enforcement. However we are aware of the importance of this information with regards to the deployment of our resources. Therefore in North Wales we are currently upgrading the system which collects this data. Unfortunately during the transition between systems it has been unable to collect some of this data. We hope to have the new system up and running soon and would welcome the enquiry later on in the year. - officers’ shift patterns and leave entitlements. Accordingly, we have no means of calculating or telling you accurately the total number of hours for which each mobile camera was deployed in June 2007 or June 2006. I tried to give you this information during our telephone conversation on July 12. You, however, insisted I send a written response. When I pointed out that this would merely delay unnecessarily a request that could easily be dealt with in a conversation, you became heated and tried to insist that I send you a written answer there and then, which I declined to do. You should be aware that all responses under the Freedom Of Information Act are copied as a matter of course to the Freedom Of Information officers of Bradford M.D.C. and West Yorkshire Police, who are both member organisations of West Yorkshire Casualty Reduction Partnership and who between them take the lead in FOI matters. Also, information released by the partnership under FOI is published simultaneously on our website, www.safetycameraswestyorkshire.co.uk <http://www.safetycameraswestyorkshire.co.uk>, including the original request and some details of who asked it. The information supplied to you is subject to copyright protection. You are free to use it for your own purposes, including any non-commercial research you are doing for the purposes of news reporting. Any other re-use, for example copying, circulating or publishing to others, will require the permission of the copyright holder. If you are not satisfied with this response for information, you may ask for an internal review by contacting the FOI officer, 4th Floor Jacobs Well, Bradford, BD1 5RW or by email on foi@bradford.gov.uk <mailto:foi@bradford.gov.uk>. If you are still not satisfied with the outcome of the internal review you have the right of appeal to the Information Commissioner. Thank you for your request for information, which was received by Essex County Council on 2 July 2007. The number of mobile speed unit checks undertaken during June 2006 was 361. The number of mobile speed unit checks undertaken during June 2007 was 216. Each check lasts two hours. This does not include speed enforcement checks carried out by Essex Police outside of the Partnership. This information may be available from Essex Police. I hope this information provides you with the information you require. If you are not satisfied with my response to your request, please let me know. If I am unable to resolve the issue immediately, I will explain our complaints procedure. If, after following our complaints procedure, you are still not satisfied, you are entitled to ask the Information Commissioner to review our decision. You can contact him at Wycliffe House, Water Lane, Wilmslow, Cheshire, SK9 5AF, telephone 01625 545700. I would like to take this opportunity to thank you for your interest. Please contact me if you would like further advice or assistance about your request or your right to access information held by Essex County Council. • Please state the number of mobile speed camera units deployed in your safety camera partnership area in June 2007 and the total number of hours for which each one was deployed. • Please also provide the same data for June 2006. I can advise you that we hold some of the information requested but not all. I have carried out a ‘harm test’ and ‘public interest test’ and can see no valid reason why I should not release the information you have requested. In answer to the first part of your question the Leicester, Leicestershire and Rutland Safety Camera Partnership carried out 137 mobile site visits during June 2006 which equated to 135 hrs 25 mins. This was compared to 9 mobile site visits during June 2007, equating to 106 hrs 7 mins. Unfortunately we do not hold the breakdown of hours each mobile unit was deployed. For your information as explanation to the reduction in enforcement hours in ’07 compared to ’06, we had a reduction in resources due to sickness within the team during June ‘07. The Leicestershire Constabulary in complying with their statutory duty under sections 1 and 11 of the Freedom of Information Act 2000 to release the enclosed information will not breach the Copyright, Designs and Patents Act 1988. However, the rights of the copyright owner of the enclosed information will continue to be protected by law. Applications for the copyright owner’s written permission to reproduce any part of the attached information should be addressed to The Information Security Manager, Leicestershire Constabulary Headquarters, St. Johns, Enderby, Leicester LE19 2BX. Please state the number of mobile speed camera units deployed in your safety camera partnership area in June 2007 and the total number of hours for which each one was deployed. Please also provide the same data for June 2006. Under the Freedom of Information Act 2000 s1, I can confirm that the Gloucestershire Constabulary holds this information. In June 2006, three mobile speed camera units were deployed for a total of 164.23 hours during the course of the month. At this time, the Safety Camera Partnership had a full staffing compliment, except for two weeks during the month there were only two units were deployed due to annual leave. During June 2007 the staffing compliment was reduced due to staff turnover (vacancies are currently being filled), and a single mobile enforcement unit was deployed for much of the month, with a second being deployed during the last week of the month, contributing to a total of 69.5 hours of deployment. If you are not satisfied with this response or any actions taken in dealing with your request, you have the right to ask that we review your case under our internal procedure. If you decide to request that such a review is undertaken and following this process you are still unsatisfied, you then have the right to direct your complaint to the Information Commissioner for consideration. If we can be of any further assistance please do not hesitate to contact me. Sorry for the initial confusion & delay. In June 2006 Mobile Safety Camera Vans were deployed for 464 hours, in June 2007 vans were deployed for 440 hours. Serial Number: 0001/07/07 (Please quote this reference in future correspondence regarding this submission). The information regarding at time spent at each site is classed as Site Specific and is thus exempt under Section 31 of the Freedom of Information Act. Section 17 of the Freedom of Information Act 2000 requires the Dorset Safety Camera Partnership, when refusing to provide such information (because the information is exempt) to provide you the applicant with a notice which: a) states the fact, b) specifies the exemptions in question and c) states (if that would not otherwise be apparent) why the exemption applies. The exemption applicable to the information you requested is Section 31 - Law Enforcement Sections A & B. Please see the attached table showing how the exemption applies and that the Public Interest Test has been completed. The Dorset Safety Camera Partnership provides you the right to request a re-examination of your case under its review procedures. If you decide to request such a review please write to the Operations Manager DSCP, Force Headquarters, Winfrith, Dorchester, DT2 8DZ. We have completed all searches within Cambridgeshire Constabulary and hereby enclose your response. Unfortunately we are unable to provide data broken down per van. This would involve a manual search and analysis of each individual record and would not be retrieveable within cost under Section 12 of the FOIA. as stated in the Freedom of Information (Fees and Appropriate Limit) Regulations 2004. It is estimated that it would take in excess of 20 hours work costed at £25 per hour. In accordance with the Freedom of Information Act 2000, this is a Refusal Notice for this particular part of your request. Police forces in the United Kingdom are routinely required to provide crime statistics to government bodies and the recording criteria is set nationally. However, the systems used for recording these figures are not generic, nor are the procedures used locally in capturing crime data. It should be noted that for these reasons this forces response to your questions should not be used for comparison purposes with any other response you may receive. If you are unhappy with our response and wish to appeal our decisions, please see the attachment below, which sets out your rights to appeal. Should you have any further enquiries concerning this matter, please contact the Information Access Office on telephone number 0845 456 456 4 extension 2396. I write in connection with your request for information concerning mobile speed cameras which was received by Sussex Police on 2 July. In June 2006 we had four such cameras available for use. Again information as to the number of hours they were actually deployed at the roadside is not held, but the Enforcement Officers time is recorded as 112.87 hours. Please note that these statistics will fluctuate month by month, so the two sets provided above cannot be taken as indicating any trend. There are 10 mobile camera unit vehicles deployed in Lancashire’s Safety Camera Partnership area. In June 2006, the ten camera units where deployed for 496 hours and in June 2007 this rose to 546 in total. Unfortunately, we cannot break this information down as hours are logged against the operator/officer and not the vehicle. Therefore, Lancashire Constabulary does not hold this information in the format you require. In addition to this, the data is stored on a taped backup system and also at a document storage warehouse. The retrieval of such information and the comparison of it with staffing rotas to abstract the information you require would exceed the cost limit offered by the Act. As per Section 12 of the Act, the Constabulary is not under any obligation to provide you with this information. I would like to take this opportunity to thank you for your interest in this matter. In response to your FOI request I have below supplied the data you requested. Unfortunately our database does not allow me to split the hours deployed between vehicles - I have therefore had to provide total hours. Thank you for your correspondence dated 2 July 2007.
and will continue to utilise, six mobile enforcement units. took place. One unit was out due to a reduction in staff levels. took place. Two units were out due to staff annual leave and long-term sickness. We are unable to retrieve information which details the actual number of enforcement hours per unit, as this would involve a manual search through records and cross referencing with individual officers pocket book notes. To retrieve this information would exceed the cost of compliance limit set by regulations, and is therefore exempt under Section 12: Exemption where cost of compliance exceeds appropriate limit. The combined number of enforcement hours covering all deployed units, has been provided. I trust this answers your request satisfactorily, please do not hesitate to contact me if I can be of further assistance. Thank you for contacting Safecam. I've had passed on to me from West Mercia Constabulary an FoI request relating to hours of mobile enforcement carried out in June 2007 compared to June 2006. We don't seem to be included in your circulation list, so I'm not sure whether or not it was intended for us to answer your question, but as I have relatively easy access to the data I'll do so anyway. You'll need to give some thought to the 'like-with-like' comparison issues here, as 'units' is open to interpretation, & others might take a different view. I don't know if you meant sets of equipment, vehicles, or people to use them. I've gone for people as it's primarily their availability or otherwise which determines the operability of an enforcement unit. At the beginning of June 2006 we had just taken on 4 new staff who were not trained or authorised to work independently, and another staff member was almost fully engaged in preparing for their training programme; during that month we had no more than 6 operational units who carried out 150 hours of mobile enforcement activity. This year our team is now (almost) fully staffed and fully trained, with a complement of 11. During June 2007 they carried out 452 hours of mobile enforcement. I trust that answers your question & gives you what you need. Please state the number of mobile speed camera units deployed in your safety camera partnership area in June 2007 and the total number of hours for which each one was deployed. Please also provide the same data for June 2006. I can confirm that we do hold records of all speed enforcement undertaken in June 2007 and June 2006, however, we do not hold it in the format you have requested. There are three elements that make up a “mobile speed camera unit” – namely: the vehicle; speed detection equipment (including camera); and the operator. As the operators, vehicles and speed detection equipment are interchangeable, it is not possible to tell you the number of enforcement hours “per unit”. I can, however, tell you that the number of hours of speed enforcement undertaken with mobile speed cameras by the Partnership in Bedfordshire and Luton in June 2007 was 171 hours. This was conducted by three dedicated speed camera operators, as well as some police officers who conduct some speed enforcement in addition to their other policing duties. In June 2006, the Partnership conducted 184 hours of enforcement, with five dedicated speed enforcement operators. I trust this addresses your query. May I thank you for your interest in the Partnership and draw your attention to your complaints rights, below. I write in connection with your request for information dated 02 July 2007concerning mobile speed camera units. 1. Please state the number of mobile speed camera units deployed in your safety camera partnership area in June 2007and the total number of hours for which each one way deployed. (1). 32 : 56 (2). 15 : 20 (3). 24 : 40 (4). 10 : 16 (5). 7 : 22 (6). 10 : 25 (7). 8 : 58 (8) 1 : 00 (9). 14 : 30 (10). 2 : 16. (1). 25 : 14 (2). 42 : 20 (3). 37 : 36 (4). 19 : 03 (5). 6 : 29 (6). 10 : 35 (7).11 : 24 (8) 38 : 05 (9). 16 : 48 (10). 0 : 41. I am satisfied that all the relevant information has been passed to me, and been considered in the light of your request, within the time constraints applicable under the legislation. Your request for information, received 12 July 2007 concerning mobile speed camera units has now been considered. I am pleased to provide the following information. In June 2006 one mobile speed camera van was deployed for a total of 38 hours. In June 2007 two vans were deployed for a total of 113 hours. Here's the answers to your Freedom of Information enquiry. 1. Please state the number of mobile speed camera units deployed in your safety camera partnership area. June 2007 three mobile cameras. 2. The total number of hours for which each one was deployed. Please also provide the same data for June 2006. I believe that this answers your enquiry in full. Thank you for your request for information under the Freedom of Information Act, which was received by the Northumbria Safety Camera Partnership on 2 July 2007. During June 2007 the partnership operated 4 enforcement vans at mobile cameras sites, spread across the region. These vans were deployed for a total of 274 hours at an average of 68.5 hours enforcement per van. During June 2006 the partnership operated 4 enforcement vans at mobile cameras sites, spread across the region. These vans were deployed for a total of 206 hours at an average of 51.5 hours enforcement per van. If this information is not what you require, or you require more information, please do not hesitate to make another request, clarifying your requirements further if possible. It would also assist us in processing your request if you could quote the reference number on this letter to enable us to determine the information that we have already provided. or by writing to Tanya Rossington, Information Rights Officer, Legal and Corporate Services, 1st Floor, Civic Centre, Regent Street, Gateshead, NE8 1HH. You may be required to pay a fee or comply with conditions for permitted re-use. Unfortunately we do not hold this information broken down into each individual unit and so we cannot answer the total number of hours each unit was deployed. If you require any further assistance please do not hesitate to contact me, furthermore if you have any comments relating to how your request has been handled by our authority, please contact Philip Jones, Head of Information Governance, Information Governance Unit, Friars Terrace, Stafford, ST17 4AY. Having spoken with my FOI Manager, I believe we may have had a communication problem, in that I may have misinterpreted your original question and presumed your request was site specific, which is of course exempt, as per our previous correspondence. If I am now correct, the information you require is more of an all embracing total number of hours each of the 4 units were deployed for in both June 2006 and June 2007. Please bear in mind that the above figures are influenced by staffing levels and annual leave. I hope this now answers your original question satisfactorily. apologies for the delay in responding to your FoI request of 5 July. In June 2006 we had six operators in six vans using six mobile safety cameras. We had, in previous years been running at nine (since early 2003). These operators also undertake the changing of films in our fixed cameras while they are out and about. In June 2006 these operators undertook a total of 192.25 hours 'behind the lens' operating their mobile cameras; the remainder of their time being taken up in changing 'wet' films in fixed cameras, court appearances or leave. In June 2007 we had seven camera operators undertaking the same tasks (each with their own van and mobile camera). However between them they undertook 169 hours behind the lens. There were heavy court commitments during June and one member of staff was sick for most of the month after returning from leave (and so effectively only six operators were fully active). I attach a table showing the number of hours 'behind the lens' for each operator for June '06 and June '07. This is the number of hours during which they undertook mobile speed camera enforcement. In June 2006 we had a large amount of roadworks which were being enforced by the mobile camera team; in June 2007 however we still have considerable roadworks but most of it is being covered by fixed 'SPECS' cameras (time-over-distance) - this therefore requires less camera operator time. I hope that this is of use but if you require further detail, clarification or explanation then please do not hesitate to contact me. Number of mobile speed camera units in safety camera partnership area and hours deployed for 2006 & 2007. The London Safety Camera Partnership has five (5) mobile speed safety camera units. In June 2007 these units were actively deployed for a total of 87 hours and 38 minutes. In june 2006 they were actively deployed for 94 hours and 55 minutes. Should you have any further inquiries concerning this matter, please write or contact Jon Plant on telephone number 0207 230 1333 quoting the reference number above. We have one mobile speed camera van in Merseyside and for the month of June 2007 it was operational at the roadside for a total of 77.48 hours. This is time actually setup enforcing at the roadside and does not include all the ancillary time associated with operating a mobile vehicle. We did not have the vehicle in June 2006. Your request for information has now been considered and the partnership does not hold all of the information in the format requested. Where the information is not held I will provide you with alternative figures that are held by the partnership and may be of use to you. The total number of hours for which each one was deployed. If you the applicant are unhappy with how your request has been handled, you have the right to require Thames Valley Safer Roads Partnership to review their response. Prior to lodging a formal complaint, you are welcome and encouraged to discuss the response with the case officer who dealt with your request. Following receipt of your request searches were conducted within Nottinghamshire Police to locate information relevant to your request. outstanding information that you requested. 1. The total number of hours for which each one was deployed? me should you require further information or clarification on this matter. Please also note that Hertfordshire Constabulary do publish the responses sent out under the Freedom of Information Act in the Disclosure Log which can be accessed through the Hertfordshire Constabulary web site, www.herts.police.uk. However, in accordance with the Data Protection Act 1998, the identities and addresses of individual applicants are not published. Thank you for taking your time to write to Hertfordshire Constabulary.